Classic and pretty Lisa Anne. Modern day bridal chic meets old Hollywood red carpet style. The Lisa Anne is a classic wedding dress that will last the test of time with out having the obvious trends that will date quickly. Wedding dresses in Melbourne the Lisa Anne is extra lovely and comfortable for all shapes and sizes. 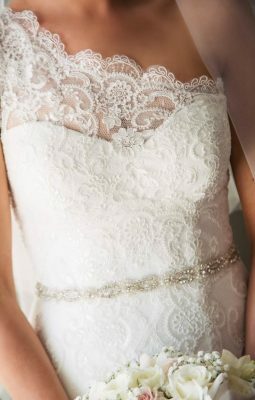 Style of this classic bridal gown. The Lisa Anne is made from a satin base and lace bodice. Travelling up the skirt to a lace and tulle illusion neckline and full semi circle cut skirt with an in built double layer petticoat for extra flare. Fabric: De-lustured satin and lace bodice with an in built double layer petticoat. We added our favorite brooch the vintage style to the dress. You can add any style of brooch or even a belt like the cinderella belt would be a nice touch. A pair of pearl earrings and hair comb would complete your classic wedding dress the Lisa Anne. We believe that alterations should be easy and shouldn’t require you to find a tailor. We perform all alterations in house, allowing you to easily fit your dress. The Lisa Anne has a few elements that are evenly combined to balance out this classic style. However if you wanted to create a more dramatic finish you could consider a few rhinestones on the bodice or a glittering belt or motif to glitz around the waistband. The Lisa Anne is available in store now in white or ivory in sizes 6 to 28 and is designed by Leah S Designs as part of the Dream Wedding Dresses Collection.